Generally from a fall onto the posterior elbow, fall onto outstretched hand, or MVA. Bimodal distribution: patients in second decade with high-energy trauma and elderly patients with low-energy falls. Distal humerus is composed of a medial and lateral columns separated by the trochlea. Medial column diverges from the humeral shaft at @45º angle. Lateral Column diverges from the humeral shaft at @20º angle. 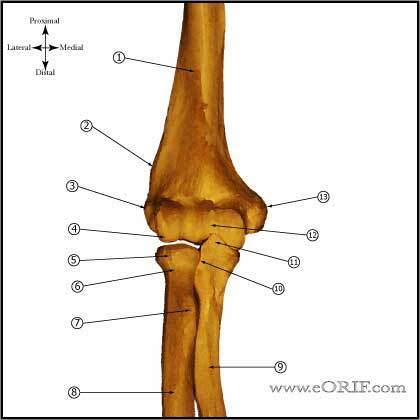 Trochlea has a 300º arch of cartilage. Pain, swelling, deformity, loss of motion. 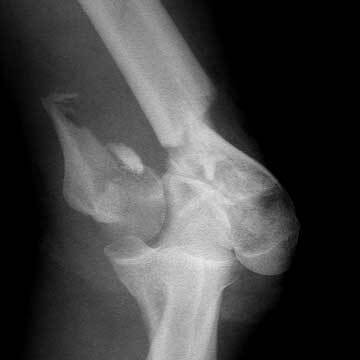 A/P, lateral and oblique views of the elbow demonstrate fracture. CT scan: typically indicated do to complexity of most distal humerus fractures. 3D reconstructions with radius and ulna subtracted are beneficial. Non-displaced: rare, consider non-op management if CT scan confirms <2mm articular displacement. 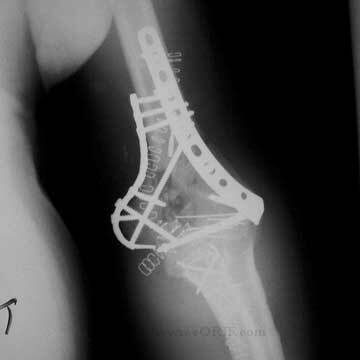 Displaced: Distal Humerus ORIF. (Sanchez-Sotelo J, JBJS 2007;89:961). Elderly (>70y/o) / low funtional demand / inflammatory arthritis: Total Elbow Arthropasty (Cobb TK, JBJS 79A:826;1997), (Frankle MA, JOT 2003;17:473), (Kamineni S, JBJS 2004;86A:940) (McKee MD, JSES 2009;18:3) (McKee MD, J Shoulder Elbow Surg. 2009 Jan-Feb;18(1):3-12.) Recommend permanent 5 pound lifting restriction to avoid loosening. 6 Weeks: Begin active extension, strengthening exercises provided fracture union is evident on xray. 3 Months: Ensure full restoration of shoulder and elbow ROM. Consider bone stimulator if union is delayed. Sport specific rehab. 6 Months: return to full activities / sport. Outcome after ORIF of intra-articular Fracture’s= Mean flexion contracture-25 degress, mean arc of motion-108 degrees, @75% of normal strength. 24% reoperation usually for HWR (McKee JBJS 2000;82A:1701).